were recorded but the number of deaths have witnessed more than 100pc increase during the month of June as compared to previous month. According to CMC statistics, security forces have also increased their intelligence based operations and arrested 1167 suspects including militants and their handlers/ supporters from various parts of the country. According to CMC’s monthly report, there has been almost 8pc decrease in militant activities during June while number of deaths and injuries in militant attacks have gone up with almost 25pc and 38pc, respectively. Militant activities were continuously on the rise during first half of the month but the sharp reduction was witnessed during second half of the month after the operation was launched on 15 June 2014. From 1-15 June, 84 militant activities were monitored in which 181 people were killed and 154 others injured while the number dropped to 57 militant activities, 76 casualties and 116 injuries during the period from 16-30 June. Thus after the operation, there has been more than 32 pc decrease in number of incidents, more than 58pc decrease in number of casualties and almost 15 pc decrease in number of injuries. 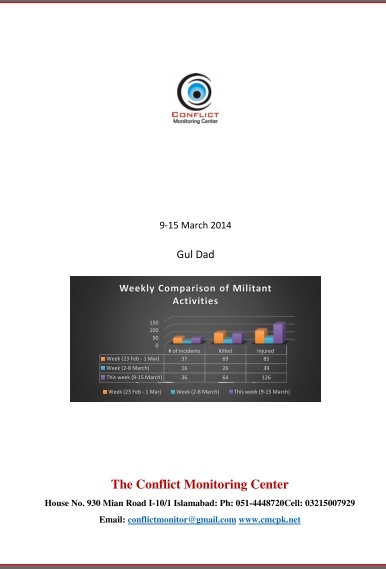 CMC’s monthly report marks first half of the month to militants when they managed to launch successive attacks including the most significant and strategic one on the Karachi Airport. Militant’s attack on Karachi Airport was such a significant that it compelled and stimulated security forces and the government to immediately start military operation against the militants and thus second half of the month was attributed to security forces actions. Security forces launched operation Zarb-e-Azb in North Waziristan to weed out militants from the area. According to CMC statistics, security forces conducted 127 operations across Pakistan (including those conducted under NWA operation) in which 517 suspected militants were killed, 25 others injured and 1167 suspects arrested. Severity of the security forces actions can be gauged from the fact that the number of deaths has witnessed an almost 189pc increase as compared to previous month. Over 251pc increase in number of arrests clearly suggest that security forces have also tightened noose around the neck of the militants in various parts of the country and arrested many of their operatives as well as supporters while making effective use of intelligence. One of the most important development is a sharp decrease in militant activities in Baluchistan during post-operation period in FATA. From 1-15 June, 22 militant activities were monitored in Baluchistan in which 41 people were killed and 42 others injured while the number of incidents and resultant deaths have drastically come down from 16-30 June when four incidents were recorded by the CMC in Baluchistan in which three people were killed and one other injured. This development is important since insurgency in Baluchistan is believed not be directly linked with FATA-KP based militancy.